Kung Hay Fat Choy 2018! Best Wishes for a Happy Year of the Dog! 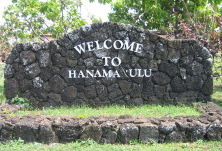 Welcome to the Hanama`ulu Community Association Web site! 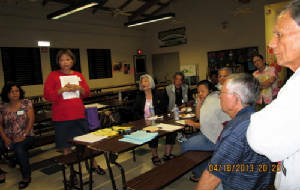 The approval of the revised Bylaws of the Hanama`ulu Neighborhood Association at the membership meeting on Thursday, June 16, 2011, officially change the name of the association to HANAMA`ULU COMMUNITY ASSOCIATON. 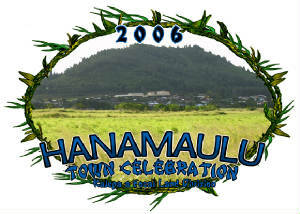 In 2007, in an effort to continue the momentum from the first Hanama`ulu Town Celebration in July 2005 and the second celebration in July 2006, to continue to bring the community together, and to address the needs of the town, Hanama`ulu Neighborhood Association became a bona fide organizaton. The same community members who provided leadership to the celebrations formed the vanguard of the new effort and continue their leadership roles today. 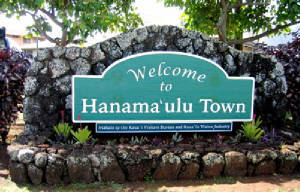 And many others who share their vision and commitment to the town of Hanama`ulu have joined them. Rayno Park and Hanama`ulu Beach Park are gathering places for the town and the community-at-large, so the association has focused considerable attention in maintaining the parks so families can enjoy relaxing and visiting there. For example, in partnership with the larger community and the County of Kauai government in early 2008, HNA spearheaded a major cleanup of Hanama`ulu Beach Park on two Saturdays, March 15 and 22, with a grand re-opening of the park on Saturday, March 29. And at the start of 2011, the spark plug of Hanama`ulu, Eddie Sarita, started working with the County Dept. of Parks and Recreation on plans for another major cleanup of Hanama`ulu Beach Park. Groups of volunteers worked in advance of the major push on Saturday, April 16, when some 77 volunteers gathered at the park from 7 to noon. After the long morning of work under the hot Hawaiian sun, the volunteers gathered and celebrated near the pavilion, which was freshly painted, over a sumptuous lunch of pasta, steak, barbecued sausage, and soft drinks provided by generous individuals and corporate entities. Visit the Newsletter, Meetings, Events, Rayno Park, Swap Meets, Beach Park and other pages of the Web site for the latest activities of the Hanama`ulu Community Association. please call one of the officers. Contact numbers are listed on MEMBERSHIP page. *Thursday, June 29, Hanama`ulu Community Association hosted a meeting to address helicopter and Hanamaulu`ulu Beach Park concerns. Ina of the Helicopter Company Association provided information on helicopter routes and whom to contact for concerns. Also, representatives from the Kaua`i Police Department and Parks and Recreation attended to update the community on Hanamaulu`ulu Beach. Refreshments were served at the 6:30 PM meeting. *Tuesday, April 25, 2017, Chairman Eddie Sarita did a presentation on the "Maintenance of Kalepa Cemetery" at King Kaumuali`i School Cafeteria. The 6:30 PM meeting was a call to organizations and community members to assist in maintaining the cemetery where the forebears of the townspeople are buried. HCA served refreshments as usual. *Tuesday, February 28, Theresa Koki and Marc Ventura updated HCA on the Adolescent Treatment Facility. Also, the County Planning Department presented a possible draft of an ordinance that would allow owners of residentially zones properties to construct additional residential rental units. 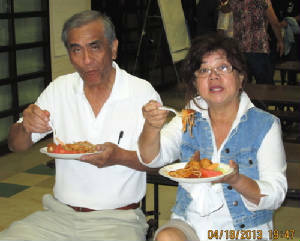 Refreshments were served at the 6:00 PM meeting at King Kaumuali`i School Cafeteria. *Thursday, January 19, a public informational meeting on Safe Routes to School (SRTS) Phase I was held from 6:00 to 8:00 PM at King Kaumuali`i School. The plan includes widening and re-striping to create a pedestrian path on Ho`ohana Street and `Akuli Street from Laukona Street to Hanamaulu`ulu Road. The HCA meeting on Thursday, August 18, 2016, at King Kaumuali`i Elementary School Cafeteria, started promptly at 6 p.m. After chairman Eddie Sarita’s brief opening remarks to welcome the 50-plus members, families and neighbors in attendance, and the featured speakers, the Reverend Roy K. Sasaki, a retired United Methodist Church pastor who is a member of the association, offered a brief invocation on community unity and said grace. With the D. R. Horton representatives having to catch the 7:45 flight back to Honolulu, Eddie facilitated the meeting with dispatch. He himself prepared the sauce for the spaghetti, and he wanted those in attendance to get their supper before the meeting started. With Laurie Kelekoma serving as hostess, the buffet was set up with two lines that moved with speed, enabling the meeting to begin without delay. Presenting the update on the Kohea Loa Project, also called Hanama`ulu Triangle, were Bob Bruhl, president of the Hawai`i D. R. Horton-Schuler Division, and Tracy Nagata, senior vice-president of design and purchasing for D. R. Horton Hawaii. Also, present was Steven Arnett of Wailua, building supervisor, and Kaua`i County Housing Agency personnel. Hanama`ulu Triangle will consist of 440 housing units on four parcels built in four phases. Phase I is Parcel 4, Ho`oluana, on 24 acres. Construction of the 151 housing units is to begin at the end of the year, with home buyers moving in in mid-summer 2017. The housing project, on land that once belonged to Grove Farm, was started in March 2016 with mass grading and putting in place water and sewage lines and roads. Completion is the end of the year, when construction of the 151 units of Ho`oluana should begin. The three other parcels are: Parcel 1: Kumupa`a, on 3.82 acres; Parcel 2: Manawale`a, 8.1 acres; Parcel 3: Ho`olilina, 14.5 acres. On this note, the housing units come with 2-car garage components. During the Q & A period, dust control, flow of traffic in the neighborhood, buying into the project, noise from helicopters flying over the housing and incorporating needs of the elderly were called to the attention of Bruhl and Nagata. In terms of dust control, Arnett said that watering is now done all day long. For dust control, call Forrest at 346-9246. Nagata said that sidewalks are part of the project but not outside the project. Also, traffic flow on Hanama`ulu Road and other community roads have to be addressed by local authorities. The meeting continued for another 30 minutes after Bruhl and Nagata left for Lihue Airport, with the topic focused on affordable housing. Personnel from Housing and Community Development (HCD) of the Kaua`i County Housing Agency said that the list of home buyers now numbers over 300. First-time home buyers who are interested in buying units at Hanama`ulu Triangle should apply in order for their names to be added to the list. Those on the list will be contacted by the county agency. HCD addresses issues on affordable prices based on family size and bedroom count. The meeting ended with clusters talking story. Eddie Sarita and his assistants locked the doors of the cafeteria at 8 p.m.
As Kaua`i residents and visitors who travel from Lihu`e Airport to the North Shore notice, the area between the highway and King Kaumuali`i School and the adjacent housing subdivision has been a construction site for many weeks. With that said, Hanama`ulu Community Association is hosting an informational meeting on the "Hanama`ulu Triangle" project. Tracy Nagata and Bob Bruhl are featured speakers. Earthworks Pacific, Inc. commenced grading the site for Ho`oluana at Kohea Loa Housing Subdivision on March 14, 2016. The company expects to finish the work on December 31, 2016. The officers and members of HCA cordially invite you to the meeting. WHEN: Thursday, August 18, 6:00 p.m.
For more information, please call 346-0090. Mayor Bernhard Carvalho and his team held a meeting with the Hanama`ulu community and the Kaua`i community-at-large at King Kaumuali`i School Cafeteria on Thursday, May 19, on the treatment facility planned above Ma`alo Road in Kapaia. 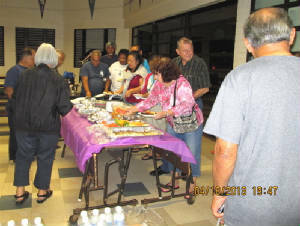 The Hanama`ulu Community Association provided refreshments for the 6:30 p.m. meeting. At the request of the Hanama`ulu Community Association, the County of Kaua`i provided a bus tour to the proposed landfill on Saturday, January 23, 2016. County officials Larry Dill and Lyle Tabata accompanied 17 interested residents of Hanama`ulu on the tour. The EIS (Environmental Impact Statement) is expected to be released in late 2016. Mayor Bernard Carvalho Jr. is special guest at the association's meeting on Thursday, February 19, when he and his staff will present an overview of the budget of the County of Kaua`i and how the budget may affect the community. Members, families, neighbors and friends are encouraged to attend, listen to the presentation and talk to the mayor and his staff on issues of concern. Bring your family, neighbors and friends! On Thursday, April 17, 2014, County Director of Parks and Recreation Lenny Rapozo reported to the Hanama'ulu Community Association at its 6:30 meeting at King Kaumuali'i School Cafeteria on the demolition of the old pavilion. The demolition permit was approved, but the county has to do an assessment on hazardous materials prior to the demolition. The county plans to build a new pavilion to replace the old one. August 19, 2014 Update: A visit to Hanama'ulu Beach Park this morning confirmed the opinion that the county has not demolished the old pavilion four months after the announcement was made. As far as could be ascertained, the county hasn't done anything at the site at all. The February 20, 2014, meeting of the Hanama;ulu Community Association featured Mayor Bernard P. Carvalho Jr. and Kaua'i Life Choices Coordinator Theresa Koki, who made a special presentation on the proposed Adolescent Treatment and Healing Center to be built on Maalo Road above Kapaia. The Mayor and Koki addressed concerns of the community. 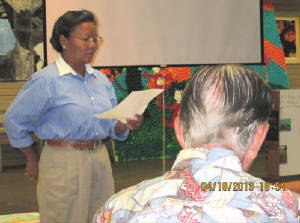 As a service to the community, Hanama'ulu Community Association had Kaua'i Island Utility Cooperative (KIUC) on its agenda on Thursday, October 17, 2013. Paul Daniels, KIUC Energy Services Representative, was among the KIUC personnel who attended the meeting. Among suggestions to lower electric bills, he mentioned that ceiling fans consume a great deal of energy. Flourescent bulbs are better than incandescent light bulbs. Mr. Daniels distributed LED bulbs to those in attendance. The 6:30 meeting included a light dinner. The closure of Hanama'ulu Post Office has been an ongoing concern of the town's residents. Juan (Johnny) Rabasa, retired Postmaster of Pakala, has been the voice for the association and the community to save the post office and the conduit for news on the post office. The Monday, July 22, 2013, meeting of Hanama'ulu Community Association, was in response to the information on the closure of Hanama'ulu Post Office and an effort to unite once more to save Zip Code 96715. * Reinstall gate to control traffic to river mouth and boat ramp. HOW: Please bring your weed eater, hedge trimmer, paint brush/roller, wheelbarrow, hoe, shovel, any tool that can be used for the cleanup. WHAT ELSE: Lunch and refreshments for all volunteers courtesy of Hanama’ulu Community Association. FOR MORE INFORMATION: Contact Eddie at 346-0090 or 241-6623. A social event with no formal meeting and business agenda. Agenda: *Deane & Joaquina Abben will give an update on their plans and progress on Hanama'ulu Store, which was destroyed by fire on December 14, 2012. *Dept. of Health will report on an upcoming Health Assessment for Hanama'ulu. A touch of community: Talk story over light dinner with refreshments. For more information, call 346-0090. Joaquina gives an update on the Abbens' plans. Deane Abben listens in the background. Some 25-30 attended the April 18 meeting. An attentive audience listens to the speakers. Spaghetti dinner, fruits, rolls, desserts & drinks! 1. Deane & Joaquina Abben share with the community their plans on the rebuilding of the Hanama'ulu Trading Co. complex, including Hanama'ulu Store. 2, Health Dept. staffers informed the community of the dept. 's upcoming assessment of Hanama'ulu's water supply. 3. Juan Rabasa reported that the status of the USPS at Hanama'ulu, which was diverted to Lihue P. O. when the post office was destroyed by fire on Dec. 14, 2012, is not known at this time. 4. Laraine Moriguchi, chair of the Adopt-A-Highway Project, announced the highway rubbish pickup on Saturday, April 20, to start at 7:30 am, with the group meeting at the parking lot of Hanama'ulu Cafe. 5. 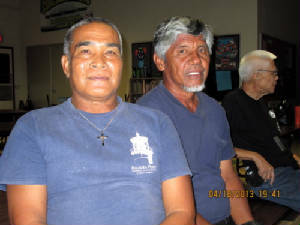 Eddie Sarita, President of HCA, recognized Ricky Banquel & Don Guerrero, who fixed the bus shelter at Hanama'ulu Park after an unknown/unseen vehicle rammed into it. Banquel & Guerrero painted the upper section and will also paint the floor, accomplishing almost immediately what the County of Kaua'i would take at least six months to do. relax during talk story time. We invite you to visit our Web site often. And we invite you to attend our meetings. Our members are more than happy to answer any question you may have about the Hanama`ulu Community Association and how you can join. Please pass the word. Click "Recommend This Site" below. The Web site address is www.htcelebration.org/hanamaulunneighborhoodassociation. Please e-mail us to offer comments on and suggestions for the HNA Web site. Copyright 2007-2018. Poipu Web Designs. All Rights Reserved.